Are you concerned with the increase in fake news and misinformation? As a producer and consumer of information, you can make a difference — YOU can counter misinformation and bias. Here are 6 ways you can make a difference NOW by critically evaluating news, becoming an more engaged consumer of information. 1. Think before you share. Read the entire piece, not just the headline, before you decide whether or not to share. 2. Verify an unlikely story. Check to see if other reliable news sources are reporting the same story. Snopes and Politifact can also be useful in determining the veracity of a claim or story. 6. Think critically about your sources. While technology can be useful in identifying fake news and misinformation, you shouldn’t rely solely on online tools. These tools can still fall victim to human error and bias. 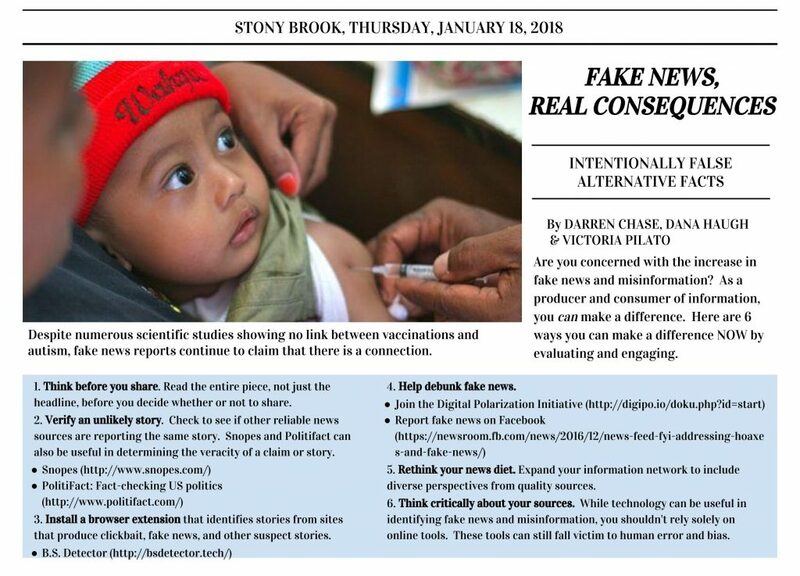 For more resources and strategies, see the SBU Libraries Fake News guide. Darren is the SBU Libraries head of Scholarly Communication, and library liaison to: the Sustainability Studies Programs; the Center for Dance, Movement and Somatic Learning; and the Department of Theatre Arts.